Find a historical list of artists and postcards from previous years here. The Loring Park Art Festival is produced by the experienced artists who are Artists for Artists LLP. In 1999, Carol Rahr Haubner, Pat Parnow, and Mary Ann Snedic Wunderlin hatched a plan. After years of participating in other art festivals, these three artists wanted to use their experiences and knowledge to create a festival designed for artists, by artists. Loring Park would be their "new canvas". Under the name Artists for Artists, LLP, they launched the Loring Park Art Festival the following year. Their commitment to providing artists an exceptional venue to display and sell their work has proven to be a success, as Loring Park Art Festival has been listed in Sunshine Artists Magazine as one of the top 100 fine art festivals in the nation since 2004. Together, these women have over 100 years experience in exhibiting, consulting and jurying numerous art festivals. Carol Rahr Haubner is a photographer, who participated in art fairs for 32 years with eight years of experience as an artist consultant and 14 years at Loring Park Art Festival. She has an M.A. Degree in Education from the University of St. Thomas. Pat Parnow is a photographer and has participated in art fairs for 39 years. With 19 years in the administration of Loring Park Art Festival, she is now the Director. She has a B.F.A. from the Minneapolis College of Art and Design. She is an artist consultant and juror for various art events, works as site coordinator for the May Day Festival and is an art mentor, photographer and driver for the Art Bus ASAP. Mary Ann Snedic Wunderlin works in wood, creating two dimensional wood assemblage pieces. She has participated in art fairs for 46 years, worked as an artist consultant for six years and 14 years at Loring Park Art Festival. Mary Ann is a member of the Minnesota Crafts Council and a charter member of the National Museum of Women in the Arts. She has a B.A. in Art Education from Mount Mary College and attended Banff School of Fine Arts in Banff, Alberta, Canada. While Carol and Mary Ann retired from managing the event in 2013, their skills, knowledge and love for the festival has left a strong legacy. Cindy Knowlton Jacobson, a long-time staff member to the festival was invited to help shape the future of Loring Park Art Festival as assistant director in 2013. Cindy Jacobson is a photographer who exhibited at art fairs for 25 years, worked as an artist consultant for five years and volunteered for Loring Park Art Festival for 10 years before becoming the Assistant Director. She also works with elementary students in Minneapolis Public Schools, nurturing their creativity. Cindy has an A.A. Degree in Psychology from Minneapolis Community College and completed a Commercial Photography program at North Hennepin Community College. 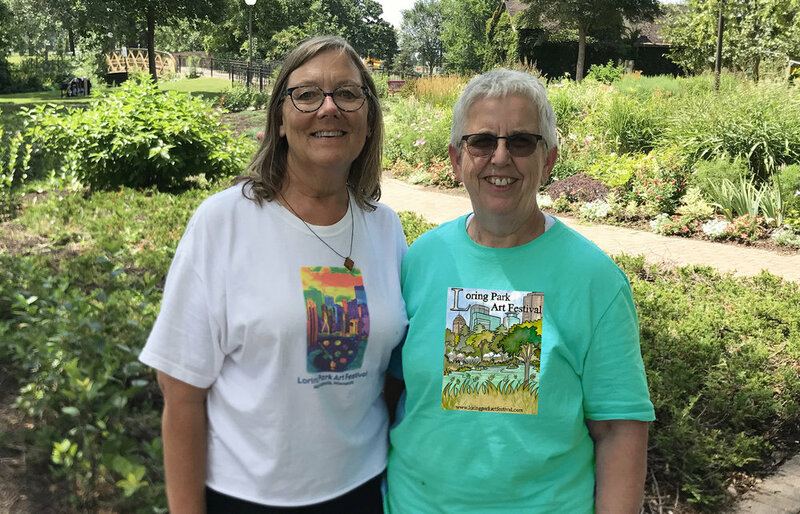 Pat Parnow (director) and Cindy Jacobson (assistant director) are business partners, members of MNFEA (Minnesota Festivals and Events) and are Artists for Artists.